Flashpoint have announce the all important EVOVL Twin Head Bracket / Godox AD-B2, which will combine two EVOLV 200 / Godox AD200 strobes into a single 400Ws light source, with Bowens S-type mount, and dual LED modelling lights! And the brackets are available now from Adorama for $59. The twin bracket can use either the original 2 flash bulbs straight from the EVOLV 200 /AD200 strobes, or an optional single AD360/II flash bulb centered in the bracket. 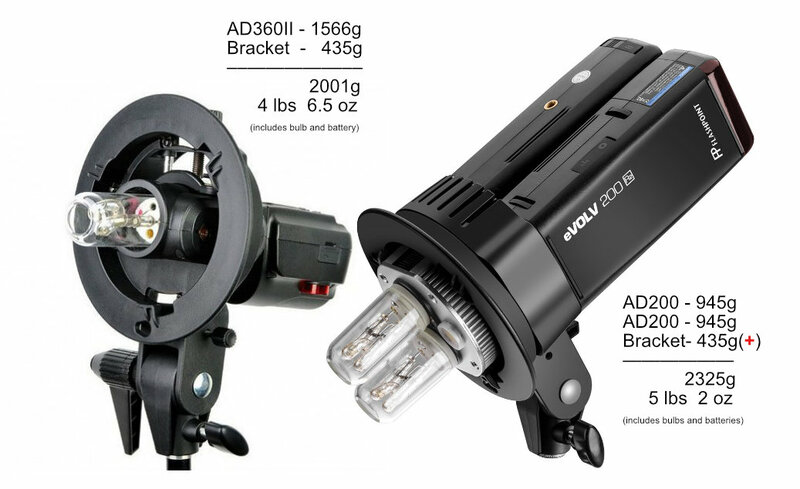 UPDATE – Godox have actually changed the bracket before the final production to only accept a single AD200 bulb centered in the bracket, for use with only one strobe mounted. So the AD360/II bulb will not longer fit in the bracket (as pictured below). And the twin bracket itself remains nice and compact for transport. Regular Bowens S-type modifiers and reflectors can then be easily attached to the convenient 400Ws twin flash set up. The EVOLV 200 / AD200, and full Godox 2.4GHz flash system are now compatible with Canon, Nikon, Sony, Fuji, and Olympus / Panasonic camera systems. I wonder how bright those modeling lamps are…bright enough to do video with? Also, I mean if you have 2 AD200s I guess this would be worthwhile, but the AD600 would still be more powerful and take less time to setup, no? The LED’s were meant to be the same as the AD600B, so 2 of them should be 20W (and not obstructed by the flash tube like the AD600). Flashpoint haven’t provided a spec though so I’m not completely sure yet. Regarding power, placing the strobe a little further into the softbox one AD200 is only a stop less than the AD600B, so its pretty likely a twin AD200 set up like this will only be around 1/3 or a stop less power than the AD600B. I don’t think the point is really comparing to the AD600B though, the advantage here is you can have a few lights all the same, using the same batteries etc, and combine them into more powerful strobe when needed. Because often people only use one strobes outdoors to complement the sun etc, where indoors more individual lights may be of more use. The other major point of the bracket in my original design was to provide a solid modelling light for single flash use as well. Godox have not implemented the on-board battery compartment though, so I’m not actually sure what will be available with single strobe use yet. The standard AD360 flash tube option is much cheaper than a custom dual filament flash tube would be though, so that’s certainly a win. With single of dual flash tubes fitted you could likely have this set up in the bag ready to do though, just like the AD600B. Yes, AD600 should be about half a stop brighter than this (in theory, using the spec values). A single AD600 will probably also be cheaper than two AD200 + this bracket. If your intention is using one powerful light, the AD600 would be the way to go. I think this is more intended for people already having more than one AD200 or want to get a second one to use as two lights most of the time, but combine them if needed. Like, usually using one as key and one as fill or as a back-/rimlight, but if you want to dial down the sun a bit just throw both together and join forces…. you can use one battery and 2 bulbs. Wonder what happens if you put them in different groups and select different power when using the single bulb? Also I assume you can just use one AD600 in the bracket and get the advantage of a modeling light. Yes, it will be interesting to see what the flash durations are like with the single bulb as well. I’m really surprised Godox managed to connect 2 strobes to one flash bulb like this. Regarding the single flash use, I’m really not sure yet. If you saw my original suggestions, making use of the modelling light with single flash use was one of the major functions. Though Godox haven’t implemented the on-board battery compartment, so I’m not sure if both LED lights will function with just one strobe attached. I would expect at least one LED light will work, and hopefully one strobe will work ok with the single AD360 flash tube centered as well. If both LED’s work that would go through batteries quickly, though it would be better to at least have that option. Will it just be Adorama carrying this, or will there be a Godox version available from usual Godox sellers? As far as I know there should be Godox branded versions available as well. How about the total weight, is both heavier than 1 AD600 ? The twin head bracket loaded with two AD200 flashes is 5 lbs 2 oz. A standard Speed Pro S bracket with AD360II is only 4 lbs 6.5 oz (not counting the power cable). One thing concerns me is that the flashes are held to the bracket by the four hinges made to hold the flash head. Are they strong enough? I think the pins are more than strong enough to hold the weight of the strobes. Though I think the main issue to some degree was always going to be what happens if a stand goes over etc. And when you think about it, in that case I would prefer the pins in the bracket to break rather than the joiner plate being torn from the strobe (with the bracket being cheaper to replace than a strobe). The other thing is it will be hard to resist tilting a softbox etc by holding the strobe bodies. That in time could cause issues with the connections. That’s why I suggested an optional handle in the original design suggestion. That could be used to tilt the bracket as well as a handle for had holding the strobe. I don’t think Godox have made any allowance for that though, unless you possibly used the umbrella mount hole to attach a DIY handle. I’m interested. Let’s all try to guess at the price. $150? I’m a bit sceptic on this one. Have 2 AD600, 1 AD360 1 AD200 and a little V860II, so I’m all in fanboying Godox… BUT! The single AD200 is not too strong when fighting the sun, may very well be good enough for facial portraits. My flash struggled a bit with overheating(i think, it stopped working for a few minutes every now and then) when I used it with my Godox foldable beautydish softbox. With an umbrella I did not have this issue. But the question is how it will do when 2 of them are together and you put a modifier on them, will they overheat then as well? What I plan to use it for however is to put some light on backgrounds and/or hair. The small format should make it perfect for this, but then the dual link bracket won’t really be needed. Adorama’s website now states “Item is no longer available”. Sorry people, the Adorama listing accidentally went live early and they were asked to take it down. Its back up now though and pre-orders have started for $59. Can you use just one flash in the bracket?… with just one bulb plugged in? And could that be be either an AD200 or AD360ii bulb? Thinking of getting this while I still only have one AD200, and would bring it along instead of an S bracket. I’ve asked to see if I can get any clarification on that. I’m also curious to know if either or both of the LED modelling lights will function with a single flash mounted. From the beginning I tried to stress the point of this bracket was as much to provide a solid modelling light for single flash use, as to provide a dual flash bracket. That’s why to be practical an on-board battery option would have been a big help. Godox have obviously opted for a low price point though, which personally I don’t think was necessary, though you can’t have everything. Thanks. Yeah, that’s what I was thinking. Use the bracket instead of a standard S bracket, and have the use of the modelling light. I presume each modelling light would run separately from each AD200’s battery? I’m excited to try this. The options and flexibility of the Godox line amazes me. Is there a view of this unit to show how the 200s attach to the bracket? When using multiple strobes, often they all have to be fairly close in output. When using 600s, this dual setup is close enough in output to be useful in combination with the 600, or could serve as backup in case of failure of one 600. Similarly two speed lights could serve las backup to a 200. Godox is extremely versatile in this regard since everything works from the same trigger system. Ever since the X1T-O, I started taking Godox much more seriously and figuring out how I should start investing in the system. The EVOLV 200 is a really interesting item. You could go fresnel, bare-bulb and soon LED. They should take a decent beating due to their lack of moving parts. Now, you can pair them together. Giving you just .5 stops less than the full AD600. For about $100 less including the bracket. Impressive. Been trying to figure out where to start. As a frugal photographer, I need to figure out where to start. I thought the AD600’s were the obvious start. But even when paired and the bracket, the AD600 is 2x as heavy. With 98% of my outdoor shoots, using one speed lite to power a small to medium modifier has been more than enough. Even for longer shoots. I think I got about 700 shots on a fairly bright day before I started noticing the longer recycle times. So for now, I think it’s the EVOLV 200 and one bracket when I want to pair them up to use a big modifier in the studio. Then a couple move EVOLV 200s for a couple of other modifiers or spare. I should be able to pack 4 of these into a medium-sized pelican case and that will work for a small to medium-sized shoot. Possibly all day. I think the EVOLV 200s give us a third option when lighting and really, a smart move for Godox. While I can still use speedlites for location work, the power, toughness (I think) and versatility of the EVOLV 200s are too much to pass on. Speedlites will be relegated to mostly event photography which I have to have as well. Which is more investment and more bottom line for Godox. I don’t consider this a “milking me for every penny” move though. I consider this a “being more efficient on shoot day” kind of move. Instead of 50lbs of gear, I can shrink that down to 20lbs. Or instead of 6 items, 3 will do. I got a feeling the Godox designers got to be real photographers and have a good amount of say at their company. Provide really great low-medium cost systems for a few more years to develop a great reputation and culture. Then, if they want, they’ve built the reputation to move into the pro market with 1000w+ lighting systems and beyond. If they keep innovating the way they have, that will be one great future. Yes! The LED lights with just ONE eVOLV200/AD200 mounted on the TWIN Head. Simply line up the eVOLV to the mounting dock, slide her until it locks and you’re in business. What a great light, this eVOLV200! Just used them (barebulb head) in Flashpoint Hexapop’s for light modification. Fantastic lighting with portability and quality. Great thanks for that qliq! What’s the major advantage of this setup over the AD360II? I know obviously you get 40W more power, but the entire setup is so much more expensive. How does the recycle time compare? The advantage is that if you already have 2 AD200s you can combine them. It’s not designed to be a replacement for the AD360 (which incidentally is just a smidgen over 300 Ws, nowhere near 360). That’s an interesting thought about the recycle time. At the same light output the AD360II and single AD200 are pretty much equal (that’s setting the AD360II 1/3rd of a stop less than the AD200 to keep the light output equal). So with two AD200 combined set to match the light output of one AD360II, the recycle time should be considerably faster. If I calculate right (both AD200 set to 1/2 +0.3) recycle should be around 1 second! Another considerable advantage is that the AD360II do not have any practical modelling light option available. Unless you use the $12 DB-02 cable to combine the PB960’s two ports, in which case the AD360’s recycle time is cut in half. Best $12 I ever spent on lighting. That is using the DB-02 cable though. Without that the AD360II is considerably slower than the AD200. Does anyone know if this will be available directly from Godox or other Godox dealers? I’m in Hong Kong. Flashpoint haven’t mentioned any exclusive deal so I think they should be available as the Godox AD-B2 from usual Godox dealers. This would double the Guide Number to GN 120m right? Does anyone know when it will be available? Ive yet to see a release date. I got one preordered! Anyone know when the release is? They are being offered on Amazon now. UPDATE – There is a limited shipment of the eVOLV Twin Head arriving this week! I would just be interested to know if the release of the twinhead with other mounts like Elinchrom can be expected? From information I am receiving and from my own testing it appears that the AD-B2 is not designed to use the AD360 bulb at all. That’s interesting thanks mike, maybe Godox have made some changes to the bracket along the way then. The Flashpoint listing still says to only use the AD360 bulb in the center socket. Though they mentioned both LED’s operate with one flash as well, so maybe the configuration has changed before final release. Have you tried a 360 bulb in the center socket yourself? Yes, the AD360 bulb does not fit unless you modify the AD-B2, definitely 1 LED off of an individual AD200 and only position 1 can use the centre socket – it kind of makes sense, why would you carry an AD360 bulb to use this? As I said I have been conversing with Rob on this, his video has or will be edited to remove AD360 bulb info which he tested due to the wrong info on the Adorama website. So if I understand correctly, Mike. You can put an AD360 bulb in the centre position but if you do it is only powered by one of the AD200s? No, you can not use the AD360 Bulb, it does not fit, but if you do modify the bracket then you have an AD360 bulb only getting 200 watt/s of power, so no advantage – the centre hole is purely for using a single AD200 with AD200 bulb to get an even light pattern. I received a confirmation from Flashpoint that Godox have changed the final version of the bracket (without letting them know) so they only accept an AD200 bulb centered in the bracket for single flash use. The AD360 / Streaklight 360 bulb will no longer fit. I can see why Godox may have decided to go that way (so you don’t need to buy a different 360 bulb), though I wonder if the twin bulbs have any negative effect on the light patter when using a modifier like a beauty dish. My AD-B2 arrived today, so have been having a play. The LED lights are a great little feature, three levels of brightness and when both are on and on brightest setting, they are providing a mini modeling light that does work. If you set both lights to there brightest setting you can then turn them off with XT-1 triggerby double clicking the CHCH button, love this little feature, I can see exactly where the shadows are falling. Godox keep up the great inovation, I am a very happy customer. I got my dual bracket in yesterday from adorama. Whoever designed this thing made a major mistake. Each on the 2 lights mount on the bracket with the 1/4 20 treaded hole to the between the 2 lights. So to mount both lights you have to remove whatever stand mount you have on the flash to be able to put both lights on it. This makes in almost unusable for me, I have arca swiss rails mounted on the bottom on each flash, and would have to remove them every time I want to put them on the bracket! The mounting holes should have been designed so they were on the outside, but I guess godox (adorama) wanted to see the logos on the flashes more than the ability to use it quickly. Thanks Fletcher very much for your info. Can you confirm if a single AD200 will light up all the modelling LEDs? I have updated my ADB2 post which includes my way of improving the dreaded ratcheting handles of the Bowens S Bracket as well as the ADB2. I just received the eVOLV twin head bracket and gave it a run against the XPLOR / AD600B, and the AD600B is only 0.1 stops ahead in power using a Glow ParaPop 38″ softbox. The twin AD200 are slightly lighter, recycle a little faster, and the modelling light is over twice as bright as the AD600B. I still don’t think the twin AD200 completely replaces the AD600B, though the twin bracket certainly makes an awesome versatile addition to the AD200 kit. Hi, you said the modelling lightis over twice as bright as the ad600. Is it with one led only or with both leds with two ad 200s attached on it? Do you think that with just one led on, it is still brighter because the led on the ad600 is obstructed by the flash tube? Hello all how about high speed sync with two units connected. Has any one tried it yet. I’m shooting with Elinchrom but planning a switch out of Eli lights and in to Godox. This unit looks like it’ll do a good job for me but it only seems to be available in Bowens mount. Has anyone seen anything about availability of the AD-B2 with Elinchrom fitting (perhaps an AD-E2!) ?? Or any ideas about using it the AD-B2 with Elinchrom gear? You can get Bowens to Elinchrom adapters. It means that the tube will be an inch or so further back in the modifier which may change the light produced a bit. That being said the Elinchrom tubes lie flat against the head whereas the Godox tube protrudes so the two things may well cancel out. Is there any information regarding how the bracket may or may not affect the ‘sleep mode’ of eVOLV200s? On a recent shoot I was using two 200s in a AD-B2 and they ran out of battery before the end of the session. I have all of them set to sleep after 30 minutes. It seems an interesting head. You can add a modeling light for your AD200. About using it with an umbrella and standard reflector bowens 7”, is it possible? I have seen that there is a reflector from Godox, the ad-r6 with an umbrella hole. But do they fit ? that is, are the ad-r6’s hole and the ad-d2 hole aligned correctly? Unfortunately no the AD-R6 reflector is designed for the AD600B strobes where the umbrella mount is slightly to one side so they don’t line up with the AD-B2 umbrella mount. Short of drilling a hole yourself I’m not too sure which reflector will line up. You need something for a strobe which has the umbrella mount centered, but also the 3 bayonet lug sockets must be positioned with one luge centered at the bottom of the strobe mount, not the top. Thanks, you saved me 16€. I have an umbrella ‘quite parabolic’, and I liked to ‘aim’ the light bulb to the umbrella’s center as much as possible… or just use any umbrella with this head. I’ll get the head, and then I’ll think what can I do. Just to have a modelling light for my AD200 is quite interesting for me. I love everything about mine EXCEPT the click-click-click ratcheting handle. I tried another option but it doesn’t stay locked so I’m still looking for a better alternative.